I’m going to start re-publishing old articles and q&a’s that I’ve previously had published online and in the press. This first post is a biographical style piece that was commissioned and published as the cover article by Play – the instore magazine of (the now defunct) Sound Control music chain. Hence some of the discussion focusses on tech gear. 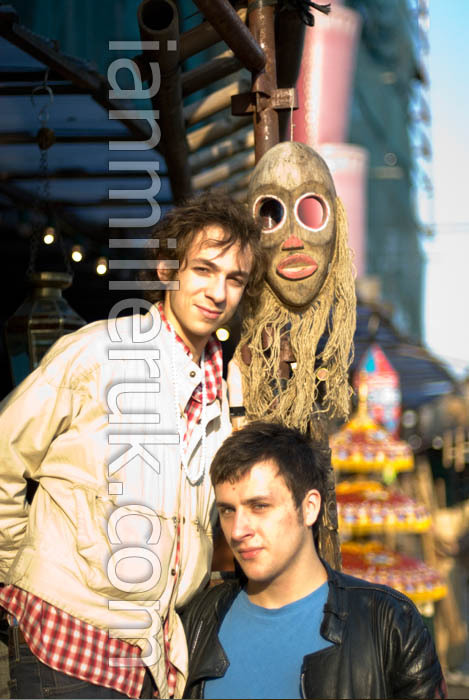 I met with Will and Kai of the Mystery Jets towards the end of the hugely busy year of touring which saw them on the 2006 NME tour alongside The Arctic Monkeys and also saw the release of their debut record “Making Dens”. From memory we walked around Camden for half hour before settling in a shisha bar in Stables Market, Camden. I have strong memories of Kai beaming about the brilliance of Billy Bragg’s “New England” and hoping that one day they too may write a song as beautiful and poetic. I recall that primarily because a few months down the line they released “Young Love” a song which instantly struck me as potentially being just that. Originally published in Play Magazine June 2006. All text and images copyright Ian Miller. “I met Blaine in nursery school when I was about four. I used to hang around his house, he’d come round mine, his dad was always around and playing records by bands like The Doors and Pink Floyd, and that’s how we got into music.”. Guitarist William Rees responds to the age old interview ice breaker question, ‘How did you all meet?’, in a fashion that certainly bucks from the typical tired statement that usually starts, ‘Well, we all met and got chatting in this pub one night…’. 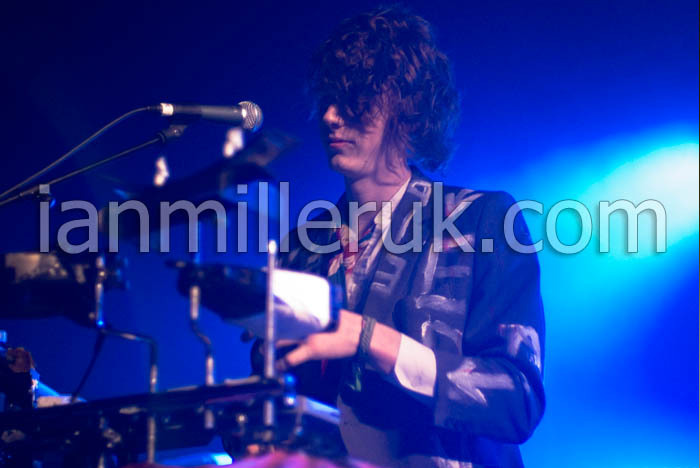 Now aged twenty-one, Will and bassist Kai Fish form two parts of popular new band The Mystery Jets. Having spent the past year touring virtually non-stop, the band recently released their debut long player “Making Dens”, a record that was lapped up by their now swelling fanbase and critics alike. 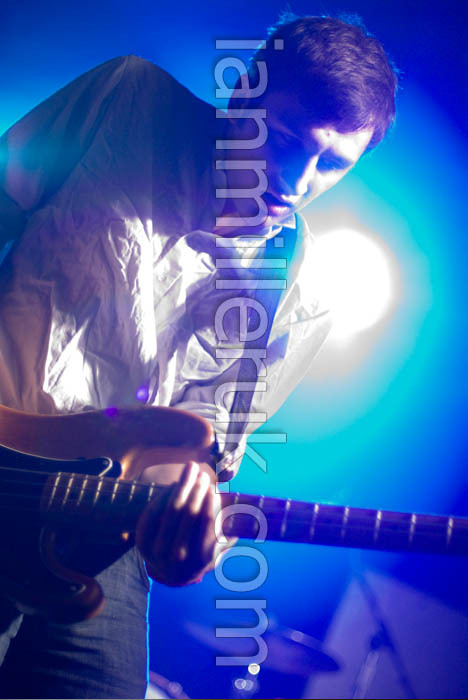 Rewarded with the opening slot on the NME awards tour – an infamous stage billing due in part to the tours previous openers that have included Coldplay, Kaiser Chiefs and Franz Ferdinand – and a primetime appearance on Top Of the Pops, you may be mistaken for thinking that they’re an overnight sensation who’re caught in the middle of a whirlwind. Far from it, with that striking opening remark the image of this band barely out of diapers, toddling round a room taking in “Dark Side of the Moon” whilst father Henry lights a candle should be firmly lodged in your head. Here’s a group who were quite literally born to be together and have spent their entire childhood developing a mature appreciation of music that’s far beyond their years. Fame is the last thing on their mind. After a couple of years of constant touring and earning their dues, the band is now in a position where they can take instrument technicians on the road with them. Having a tech is the dream of many a performing musician, “They open your World actually,” beams Will, “It means that half your brain is no longer pre-occupied with the settings on your amp, or whether your speaker’s going to blow.” Not only does this give the band extra time to focus on the performance, but also time to re-invest in developing their tastes in both old and new music. Both lads spend time obsessively discussing obscure recent discoveries such as the Animal Collection, Public Image Ltd, The Microphones and Billy Bragg’s “beautiful, non-political output”. Obviously open to any suggestion of new music and openly admitting that they’re constantly developing their approach to writing as a result, Kai returns to the subject of tech’s and how – in a similar fashion – they’re also continually learning about the importance of gear selection. “The tech’s have helped us all out. They’ve got an amazing knowledge of effects pedals and how it all sounds, they’ve lots of good ideas for us.” This obviously leads me onto the subject of what gear they actually use. Some may say that the success afforded to the Mystery Jets so far has been merely down to luck and being in the right place at the right time – after all how many people end up doing so well with their high school band? The future for them, even by their own accounts, is unknown. They don’t perform or write to any rules, they’re fortunate enough to be able to do things on their own terms, constantly taking in everything around them, evolving their tastes and having total control not only over their music but the total package of how they and their music is presented to the public. The thing that’s clear to me is that whatever the Mystery Jets do come up with next, it will certainly be a grand, interesting and nurtured piece of modern music.